David Stephenson has travelled the world in search of the sublime. This fascination is evident in his early landscape panoramas and also in his Antarctic photographs and 'Star' series of 1995. He strives to echo the human desire for transcendental meaning by making images that symbolise the enigmas of time and space, the experience of awe and wonder. From his 1990 series ‘Clouds’ to the later series ‘Stars’ the skies have held a certain appeal, partly because they represent the heavens, which are a timeless sign of transcendence. In ‘Stars’ Stephenson used a variety of techniques to capture the night sky, including long, multiple and periodic exposures, with delicate lines of light dashing or swirling across the surface of each print. They are drawings of light, marks traced by a star whose distance from us is without measure, signifying the vast nature of our cosmological universe. These images relate to the historical tradition of looking at the skies to both map our position and understand our place in the world. Signed label verso, "David Stephenson ...". Not dated. 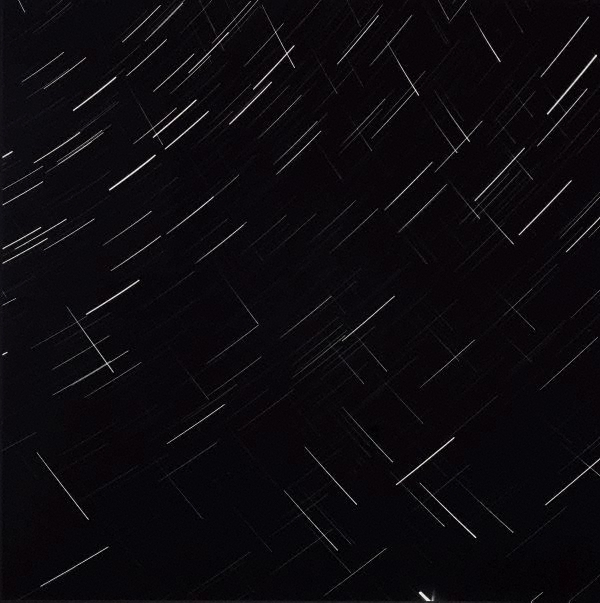 Natasha Bullock, Photography: Art Gallery of New South Wales Collection , 'Time - memory - place', pg.288-311, Sydney, 2007, 294, 310 (illus.). Keith Davis, Stars , 'Tracing infinity', pg. 30-33, Melbourne, 1999, 8 (colour illus.). John MacDonald., The Sydney Morning Herald , 'Brushing the Dark', Sydney, 04 May 1996. Robert McFarland., The Sydney Morning Herald , 'Signs among the Stars', Sydney, 23 Apr 1997. Sublimespace , Melbourne, 1998, illus..